Colombia. A country vibrant in color, personality, climates, and people. It was not what I expect, but I am already planning my next trip back. I decided to go to Colombia on a whim as Ido with most of my travel. A friend mentions a location, I see a pretty picture, or I find a cheap ticket. There is no rhythm or reason as to why and how I pick my next destination. My friends and family are just as surprised asI am about where I am traveling internationally next. With that being said, I decided to go to Colombia because it was mentioned by someone I knew who went.They explained how gorgeous it was and much they enjoyed it. After hearing thatI knew I had to go. I had it in my mind I was going to Colombia. My thoughts ofColombia centered on the drug trade, Pablo Escobar, and the Cocaine Cowboys. I had no other knowledge of Colombia. After days and weeks of research, I knew I had to go but wasn’t sure where exactly within Colombia. I am not one to stay in one place for more than three days so I knew I had to see if there were multiple places to visit, and not only were there multiple places to visit, I feel like the short amount of time I was in each city was not nearly enough. Colombia blew my mind. I visited Cartagena, Bogota, Medellin, and Guatape within the 10 days I was in the country and each city was different in terrain and weather. I visited the beaches and coast of Cartagena which allowed me to get my suntan started. 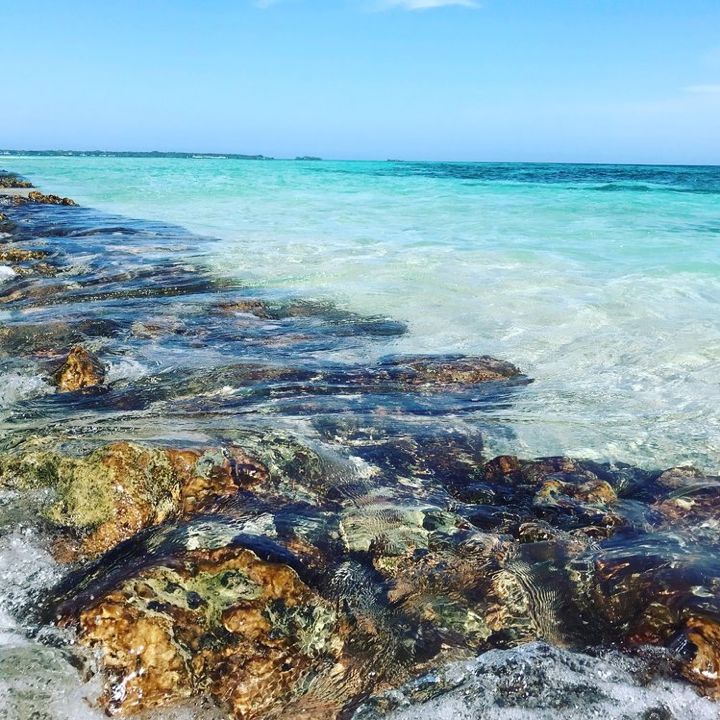 I luckily tan very quickly, even with SPF 50 on, and let me tell you, the private Bendita Beach allowed me the comfortability of laying on the beach without worrying about my items being stolen or of having to consistently say no to the beach vendors. After the beaches and sun of Cartagena, I headed to Bogota, probably the most well-known city withinColombia and toured the city and the mountains. Bogota had a few great museum sand places within the city to visit. A short bus ride outside of the city took me to Zipaquira and the Cathedral de Sal. My last stop in the country wasMedellin with a day trip to Guatape. Medellin was in the valley, surrounded by the mountains and lush greenery. 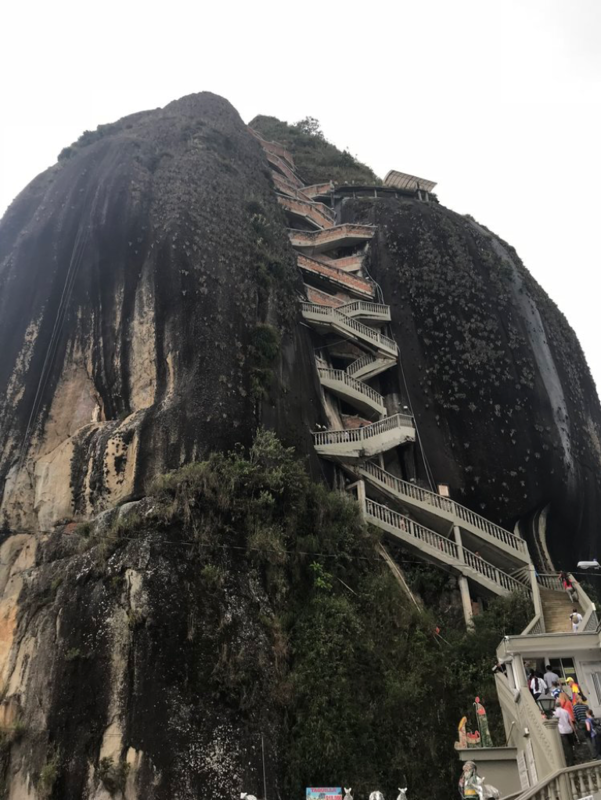 My day trip to Guatape was amazing because I was able to spend time in the cute town of Guatape as well as climb Penol Rock which, all said and done was 740 steps. Yikes! I enjoyed Colombia because it allows my money to go further, I saw more people who look like me, the transportation was very easy to maneuver and lastly, but most importantly I felt safe as a solo traveler. Whenever I solo the main question people ask is”do I feel safe”, and to be honest I have felt very safe in all of the South American countries I have visited. I have traveled by myself, walked around until late at night, and went to areas that had no tourists. I walk around with my large fanny pack; I don’t carry things which I think could be cut or ripped open life a backpack or purse. I pay attention to my surrounding and stay in areas that are well lit with people walking around. I think we need to rethink our stereotypes of which countries are dangerous and which aren’t. Does SouthAmerica have a bad history filled with violence, death, and drugs? Absolutely, but what country doesn’t have a bad history or spots within its history of violence and death? In the U.S. we have so much gun violence that it has become a normalized part of our cultural norm. Over 500 people were injured or killed in a mass shooting during a music festival in Las Vegas in 2017 and people do not blink an eye at continuing to go Las Vegas, yet if the same happened inColombia or another South American country there would probably be a travel advisory warning. Colombia has done a great job of cleaning up its country to give people, especially solo travelers, a high level of comfort and safety when traveling. As I have always said before, I think it is more dangerous to be a black woman in the U.S. than it is to travel solo overseas. With that being said, if you are trying to find your next travel destination, and want sun or the mountains or a city then you should consider South America. Within this blog are live links to the cities I visited with information on each one. Take a read of the blog posts to see if these cities are right for you to travel to, Ido not think you will regret it. I have my other blogs on Cartagena, Bogota, Guatape, and Medellin, so if you are thinking oft raveling to these other cities or the country of Colombia please read those blogs.